Last weekend, reporting for another publication, I dropped by several sessions of the HAIKU Conference at the University of Pennsylvania. Devotees of Japanese verse may be disappointed to learn that this two-day event had nothing to do with seventeen-syllable poems, but instead with a rather momentous topic: the future of arts in and humanities in research universities. "HAIKU" turns out to be the awkward, if easy to remember acronym for "Humanities and Arts in the Integrated Knowledge University." The question at hand being, what is the future of these disciplines, given a climate where institutions of higher learning are scored for financial considerations, punishing colleges majors that do not lead immediately to lucrative paychecks? Under such a system, STEM and business studies are rewarded, but the study of humanities, arts, and pure science is marginalized, or even eliminated. And that's a scary future. 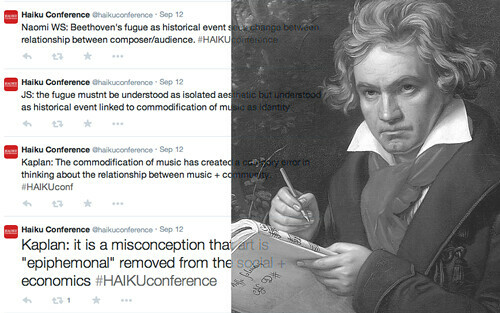 The conference was wide and free-ranging, with contributions from scholars and artists of many persuasions, and everything was live-tweeted by Art History PhD student Iggy Cortez on the @haikuconference Twitter stream. There was even a keynote address by Harvard professor Howard Gardner, the developmental psychologist who will be familiar to many of you as the author of the theory of multiple intelligences. My favorite session of the weekend was titled "Neuroscience, History, and Social Dynamics in Beethoven's Great Fugue." There was a neuroscientist who happens to love classical music; a terribly proper young British musicologist "particularly interested in the intersection between music analysis and recent Continental philosophy"; and an ethnomusicology professor who moonlights as an indie-rock drummer when he's not studying Tamil Hindu ritual musics in post-tsunami and late-war Sri Lanka. If that sounds a little unfocused, okay it was. And that's fine. A loose panel leaves room for brainstorming, reflection, and imaginative interaction. The Beethoven session opened with a performance of the Fugue by the Daedalus Quartet, a gorgeously nuanced and intelligent display by this first-rate string quartet, currently in residence at both UPenn and Columbia Universities. At Penn, the music department focuses almost exclusively on scholarship and composition. And while Penn has produced many first-rate composers, including Jennifer Higdon and Osvaldo Golijov, there is little music performance at the university. Students can take lessons and enroll in ensembles for partial credit. Aside from an occasional exchange student who wanders uptown from Curtis, you don't run across many professional-level chamber musicians in the classrooms. The quartet members spoke in turn, interacting with each scholar at his or her level of musical understanding, and taking into account the undoubtedly wide range of sophistication among the varied audience. First violinist Min-Young Kim, a Harvard and Juilliard grad, carefully defined "fugue", giving historical context and explaining how the Great Fugue defied listener expectations. She got the audience to sing the difficult intervals of the fugue's first subjects (they did a pretty good job of it) and noted, "My desire has always been that people will walk out humming the theme. Maybe this time it will happen!" Quartet photo Courtesy of Penn Arts & Culture. 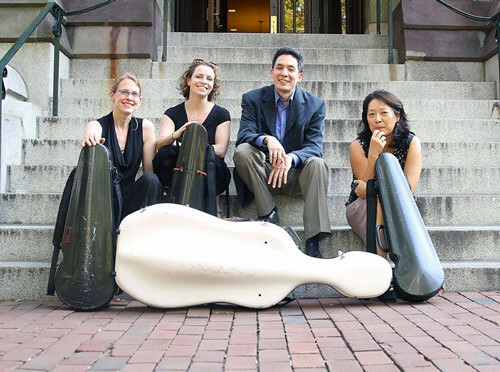 The Daedalus Quartet performs a FREE recital of music by Mozart, Bartok, and Ravel this Sunday at Penn's Rose Recital Hall (4th Floor, Fisher-Bennet Hall, 34th and Walnut Streets), 3 PM. Maybe it is the gradual abandonment of classical ideas of learning at the higher levels of academia for the more stark necessity of economics/utilitarian views,etc.? The ideas of the Trivium & Quadrivium(music being one) created an educational framework that largely produced the rich heritage of classical music(arts & humanities) we are still learning from & enjoying today. So sad we are losing sight of the forest for the trees.